In Newfoundland and Labrador, we are used to having world-class natural wonders at our doorstep. We are blessed with a dramatic coastline, abundant forests, clear rivers and a variety of wildlife. This can include globally important bird colonies, and as an extra seasonal bonus, spectacular icebergs floating by. Unlike most parts of our increasingly urbanized world, we don’t have to drive for hours to experience and enjoy nature. As the award-winning East Coast Trail demonstrates, enjoying nature is not just a popular local pastime, it’s a growing attraction for visitors from around the world. The Nature Conservancy of Canada (NCC) wants to make sure that people are always able to connect with nature close to home. Since 1996, NCC has helped conserve more than 13,000 acres (5,261 hectares) of wilderness over nine sites across the island of Newfoundland, including a section of the East Coast Trail in Maddox Cove. Now, thanks to a generous offer of land by Crosbie Group Ltd, NCC has an extraordinary opportunity to conserve a new property on the East Coast Trail in Freshwater Bay. The property is one of the most stunning and accessible nature destinations on the eastern Avalon coastline. Located just minutes from St. John’s, this 243-acre (98-hectare) privately owned property is already a popular place to hike, whale watch and escape the city. NCC wants to ensure it remains that way. Freshwater Bay has a rich history. It has long been cherished by locals and tourists alike. Now uninhabited, the area was once home to a handful of full-time residents who made their living in the fishing industry. The houses were dismantled in the early 1900s. The area has since become a popular spot for picnics and outings for residents of St. John’s. Along the rocky shore of Freshwater Bay are remnants of the SS Thetis, the famous Arctic explorer and sealing ship, which was towed here decades ago as a final resting place. For determined hikers, Freshwater Bay is a highlight on the way to Cape Spear, one of Newfoundland and Labrador’s most iconic destinations. An important part of our cultural history and a valuable recreation area, Freshwater Bay is also an ecological treasure. The property is mostly forest. It is home to a variety of native Newfoundland species, including balsam fir, black spruce, tamarack, white spruce, fox and snowshoe hare. The property also serves as an important land buffer for nearby seabird colonies of black-legged kittiwakes, black guillemots and herring gulls. Great black-backed gulls can be found nesting along the cliffs between the Freshwater Bay barachois and Sprigg’s Point. In NCC’s experience across the country, it’s rare that such a valuable piece of land so close to a capital city is available, let alone donated for public use. The donors, the Crosbie family, through their holding company Crosbie Group Limited, are faithful supporters of both their community and Newfoundland and Labrador’s wild places. 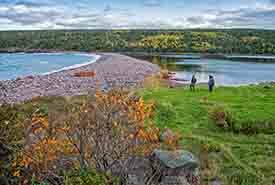 Although Crosbie Group Ltd has generously offered the Freshwater Bay property to NCC, it cannot be conserved until NCC raises significant funds. As a not-for profit land trust, our organization must secure $500,000 before we take ownership. This will ensure we can provide for the long-term care and management of this land. With community support, NCC can not only conserve this important piece of natural and cultural history on the Avalon, but also protect this popular outdoor destination for public use and enjoyment for the long term. We invite the citizens of St. John’s and nature enthusiasts from across the province to support this exciting project. Together, we can safeguard this coastal wilderness for wildlife and for our children and grandchildren.